Los Angeles, the city of angels, suffocates in traffic during rush hour. For this reason the Los Angeles Metropolitan Transportation Authority (Metro) is pushing ahead at full speed with the expansion of local transport links. In the coming years, the existing metro rail network will be expanded in a number of different places. The latest example is the Crenshaw/LAX Transit Corridor. The nearly 14 kilometer long new light rail route will improve the connection between the urban centers of Crenshaw and Inglewood as well as the region around Los Angeles International Airport (LAX). LAX passenger numbers alone show the high demand for public transport capacity: in 2016, more than 80 million passengers were processed - and the trend is rising. Between May 2016 and April 2017 the Earth Pressure Balance Shield (EPB) »Harriet« worked its way forward underground for a section of the Crenshaw/LAX Transit Corridor. The Herrenknecht TBM (Ø 6.51m) first excavated a 1.6 kilometer long tunnel between the future stations of Expo/Crenshaw and Leimert Park. It was then disassembled and transported back to the launch shaft for the second, parallel section. In April 2017 »Harriet« completed her mission below Los Angeles with the second breakthrough in the target shaft at the Leimert Park station. 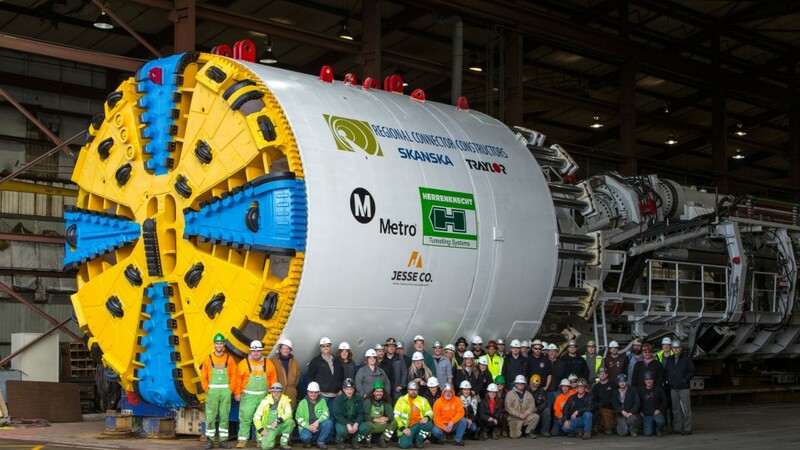 With a 24 hour best performance of 43 meters a new record in mechanized tunnelling with a subway sized EPB Shield was set for the city of Los Angeles - four more times 40 or more meters were created within one day. Thanks to weekly best performances of 170 meters the Crenshaw/LAX Transit Corridor is expected to go on line on schedule in 2019. Meanwhile, in February 2017 the Earth Pressure Balance Shield »Angeli« got under way. The TBM is boring a section of the Regional Connector Transit Corridor. It will link the existing Gold, Blue and Expo Metro Lines to new and faster direct connections. From 2020 this will allow locals and visitors to travel north-south from Azusa to Long Beach and east-west from East Los Angeles to Santa Monica without having to change. »Angeli« has just finished the first of two 1.7 kilometer long tunnelling routes. On July 18th she reappeared in the target shaft at 4th Street. Next she will dig a parallel tunnel with the final breakthrough scheduled for the end of the year. One of the greatest challenges in mechanized tunnelling under L.A. are the possible gas deposits. In order to master these safely, the contracting joint ventures have opted for special technology from Herrenknecht. The electrical components in »Harriet« and »Angeli« are explosion-protected so that safe tunnelling can be realized at all times. populated areas, thanks to the active communication of Metro the two Earth Pressure Balance Shields have already gained a certain cult status with the population of L.A.
To name the machines, Metro ran a competition for school children. From the many suggestions, the majority of the more than 50,000 online voters chose »Harriet«, thereby honoring anti-slavery activist Harriet Tubman. »Angeli« also comes from the pen of a school child. The term comes from Latin and means "angel" In the meantime, designers and engineers at the Herrenknecht headquarters in Schwanau are already working on the next order for Los Angeles. The existing Purple Line is also planned to grow by 14.5 kilometers and seven stations. To this end, in both the spring of 2018 and the spring of 2019 two additional Herrenknecht Earth Pressure Balance Shields each are to be launched in the USA. In just a few years the four machines will produce over 11 kilometers of high quality tunnel tubes. A decade ago, under similar conditions two EPB Shields from Herrenknecht had already built a total of 4 kilometers of tunnel for the expansion of the Gold Line. Herrenknecht technology in Los Angeles is thus already a real success story.